America has produced some big buzz bands lately - MGMT, Yeasayer, Black Kids and Vampire Weekend being the most prominent - Fleet Foxes seem to be the new hyped act from across the pond. Not that I'd even realised until Bella Union sent out news about a free download the band had offered up. Then after a little investigation, I discovered I was a bit behind the times. But I presume many of you are in a similar position so no matter. With comparisons ranging from Band Of Horses and My Morning Jacket to Animal Collective and Beach Boys, Yeasayer seem to be the most immediate confluence of all these influences in my mind. There's an eerie, cosmic nature to Fleet Foxes much like Yeasayer and they share a similarly psychedelic folk sound. I could maybe even go as far as tentatively suggesting that they are the sound of a thousand sunsets. Admittedly, in three months time, we will have moved on to yet another buzz band. Hence I was in two minds about whether to post anything on Fleet Foxes. The band themselves have even expressed distaste with the recent media exposure. 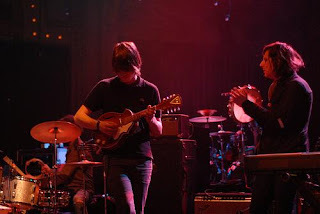 But while the hype remains in its embryonic stages, I thought Fleet Foxes deserve a window on my blog to some British readers who may not have had the pleasure of hearing them, as was my situation until very recently. Expect them to be the flavour of the month, bearing in mind their approaching SXSW appearances. Having signed to Sub Pop (Bella Union here in the UK), at least the band has appropriate outlets for their luxuriant tracks. Their 'Sun Giant' EP is out now, garnering an impressive 8.7 from Pitchfork, while the long player hits American shores on June 3rd. From that recently released EP, we have 'Drops In The River'. In consideration of my brief enforced absence, you may wish to turn back the clock and listen to my first ever podcast. It's being taken down on March 31st, a year after it was originally uploaded, [listen here]. And then you can engage in some healthy (or perhaps not so healthy) debate regarding the new Feeder material [here]. Essay length comments are optional. See you soon!